Residents of Apapa and its environment on Wednesday took to the streets in protest over the continuous blockage of roads and bridges by containerised trucks and fuel tankers. The residents resorted to protest after an earlier ultimatum given to the federal government in December last year to ensure that the trailers and fuel tankers were vacated from the roads and bridges of Apapa, Surulere and Ajegunle was not adhered to. Addressing the media at the Apapa Tennis Club, the takeoff point of the protest, the Chairman of the Apapa Residents Association, Brigadier General Sola Ayo-Vaughan, said the protest was just one of the series of protests lined up after which the association would have no choice but to take the federal government to court. â€œIn December last year we gave the government a 21-day ultimatum which had since lapsed but there was no reaction from the government. â€œIn 2017, the Vice President, Yemi Oshinbajo visited Apapa and ordered that the trailers should vacate the roads but it was of no effect,â€Ayo-Vaughan said. 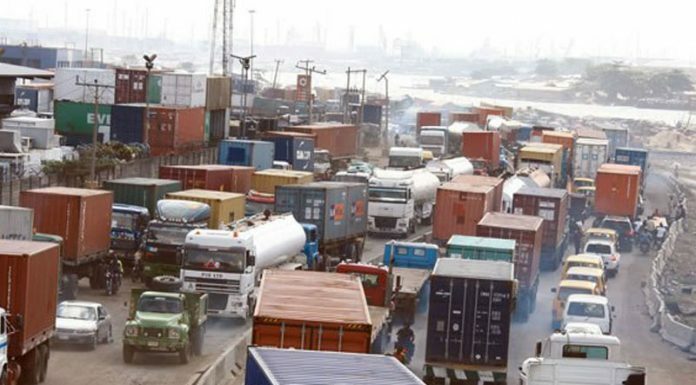 For the Chairman of Ibru Nigeria Limited, Mr. Emmanuel Ibru, who claimed to have been residing in Apapa for over 55 years said the problem of trucks overtaking the streets of Apapa started with the concession of the port, saying every truck must have a holding bay for situation to get back to normal. Another resident, Mrs. Ronke Diers charged the federal government to open up other ports in the country to save Lagos bridges from collapsing and the protect the state from epidemic with the way the truck drivers liter the streets with human wastes. The association therefore gave a 21-day ultimatum to the federal government after which if the situation remains the same, they shall sue the Nigeria Port Authority, NPA, and all shipping companies. At Area B Police Station, the protesters were met by the Area Commander, Muhammed Ahmadu, and a letter of the protest which was addressed to the nationâ€™s President, Muhammadu Buhari was handed over to him and he in turn promised to deliver it to the appropriate authority.